(Nanowerk News) There’s a lot of stuff you’d expect to find in baby formula: proteins, carbs, vitamins, essential minerals. But parents probably wouldn’t anticipate finding extremely small, needle-like particles. Yet this is exactly what a team of scientists here at Arizona State University recently discovered. Looking at these particles at super-high magnification, it’s hard not to feel a little anxious about feeding them to a baby. They appear sharp and dangerous – not the sort of thing that has any place around infants. And they are “nanoparticles” – a family of ultra-small particles that have been raising safety concerns within the scientific community and elsewhere for some years (Nature, "Safe handling of nanotechnology"). For all these reasons, questions like “should infants be ingesting them?” make a lot of sense. However, as is so often the case, the answers are not quite so straightforward. What are these tiny needles? The issue here is what the hydroxyapatite in formula might do before it’s digested, dissolved and reconstituted inside babies' bodies. The size and shape of the particles ingested has a lot to do with how they behave within a living system. Size and shape can make a difference between safe and unsafe when it comes to particles in our food. Small particles aren’t necessarily bad. But they can potentially get to parts of our body that larger ones can’t reach. Think through the gut wall, into the bloodstream, and into organs and cells. Ingested nanoscale particles may be able to interfere with cells – even beneficial gut microbes – in ways that larger particles don’t ("Applications and implications of nanotechnologies for the food sector"). Yet there’s a lot we still don’t know about the safety of intentionally engineered nanoparticles in food. Toxicologists have started paying close attention to such particles, just in case their tiny size makes them more harmful than otherwise expected ("Nanotoxicology: An Emerging Discipline Evolving from Studies of Ultrafine Particles"). So where does this leave us with nanoscale hydroxyapatite needles in infant formula? What do regulators know about nano-safety? Putting particle size to one side for a moment, hydroxyapatite is classified by the US Food and Drug Administration (FDA) as “Generally Regarded As Safe.” That means it considers the material safe for use in food products – at least in a non-nano form. However, the agency has raised concerns that nanoscale versions of food ingredients may not be as safe as their larger counterparts. Some manufacturers may be interested in the potential benefits of “nanosizing” – such as increasing the uptake of vitamins and minerals, or altering the physical, textural and sensory properties of foods. But because decreasing particle size may also affect product safety, the FDA indicates that intentionally nanosizing already regulated food ingredients could require regulatory reevaluation. In other words, even though non-nanoscale hydroxyapatite is “Generally Regarded As Safe,” according to the FDA, the safety of any nanoscale form of the substance would need to be reevaluated before being added to food products. Casting further uncertainty on the use of nanoscale hydroxyapatite in food, a 2015 report from the European Scientific Committee on Consumer Safety (SCCS) suggests there may be some cause for concern when it comes to this particular nanomaterial. Prompted by the use of nanoscale hydroxyapatite in dental products to strengthen teeth (which they consider “cosmetic products”), the SCCS reviewed published research on the material’s potential to cause harm. Their conclusion? Importantly, these studies didn’t consider what happens when particles like this end up in the digestive system, including the stomach. So what happens when a baby eats them? Intriguingly, recent research has indicated that calcium phosphate nanoparticles form naturally in our stomachs and go on to be an important part of our immune system ("An endogenous nanomineral chaperones luminal antigen and peptidoglycan to intestinal immune cells"). 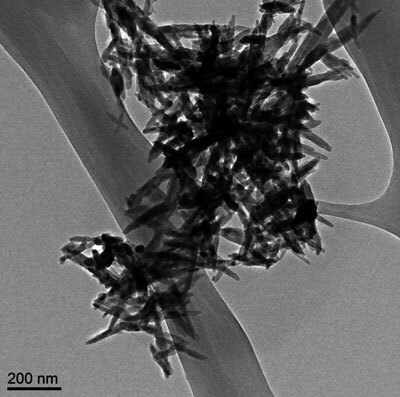 It’s possible that rapidly dissolving hydroxyapatite nano-needles are actually a boon, providing raw material for these natural and essential nanoparticles. And yet, even if these needle-like hydroxyapatite nanoparticles in infant formula are ultimately a good thing, the FoE report raises a number of unresolved questions. Did the manufacturers knowingly add the nanoparticles to their products? How are they and the FDA ensuring the products' safety? Do consumers have a right to know when they’re feeding their babies nanoparticles? Whether the manufacturers knowingly added these particles to their formula is not clear. At this point, it’s not even clear why they might have been added, as hydroxyapatite does not appear to be a substantial source of calcium in most formula. (Calcium in formula can come from a number of sources, including milk solids, calcium carbonate and calcium chloride.) If the nanoparticles' inclusion was intentional, though, current FDA guidelines suggest that the regulator wouldn’t consider the material safe by default, and should be subject to further evaluation. Given the state of science on nanoscale hydroxyapatite in foods, this is as much an issue of trust as it is safety. The FoE report may exaggerate the possible risks, and raise concerns where few are justified. Yet it’s hard to avoid the reality that, if manufacturers are adding nanoparticles to what we feed our children, we need to know more about how to ensure their safety and benefits. How else can we enable informed decisions? Luckily, current research suggests hydroxyapatite nanoparticles in formula are most likely safe, and arguably, even beneficial. But given how high the stakes are, safety here should not, and indeed cannot, be taken for granted.